Graeme Mackay, Buldoo, Dounreay, won the open and county championship, along with an armfull of other trophies. He was using a Ford 4000 tractor and Ransomes plough. 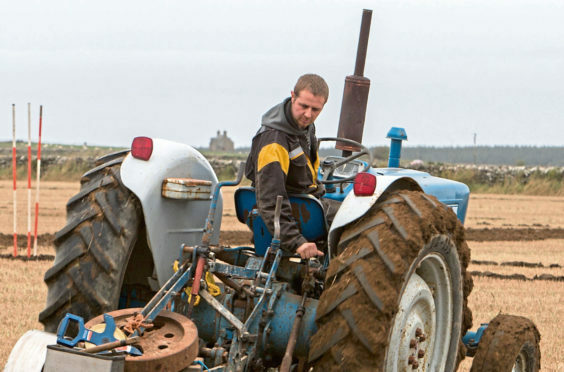 Graeme Mackay continued his long run of success at the annual ploughing match held by Caithness Vintage Tractor and Machinery Club. The 29-year-old contractor, from Buldoo, Dounreay, gave an exhibition at the match held in testing conditions at Quoys of Reiss Farm, north of Wick. Mackay got top marks for his runs with his classic rig, a Ford tractor and a Ransomes plough. As well as finishing county and open champion, he carried off the new shield presented in memory of William Gunn for the best work done with a Ford. Judges were Chick MacWilliam and Billy Henderson, from Perthshire, and James Gunn, of Whitefield Farm, Wick. The auction held after the match raised £3,000 for a local cancer charity and the Town and County Hospital in Wick. Results: Drag – 1 Michael Mackay, West Greenland; 2 Johnny Matheson, North Kessock; 3 Richard MacWilliam, Muir of Ord. Vintage mounted – Robert Farquhar, Stanstill; 2 Iain Sinclair, Thurso; 3 Michael Sutherland, Murkle. Classic – 1 Graeme Mackay, Buldoo; 2 William Mackay, Biggins; 3 Stevie Blackwood, Thurso. Outwith Caithness – 1 J Matheson; 2 R MacWiIliam; 3 Gerald Macleod, North Kessock. Novices – 1 Andrew Mackay snr, West Greenland; 2 Gavin Sutherland, Forse; 3 Brian Polson, Gersa. Juniors – 1 Will Campbell, Gersa; 2 John Gunn, Killimster; 3 Alexander Henderson, Quoys of Reiss. Best start – M Mackay. Straightest furrow – Don Macleod, Lyth. Best finish – G Mackay. Neatest ends – J Matheson. Best work by a pre-1950 tractor and best start, finish and straightest furrow in the drag class – M Mackay. Best ploughed lot by a Ford tractor – G Mackay.